→Spitball Review – Can You Make Money By Helping Students? Spitball Review – Can You Make Money By Helping Students? 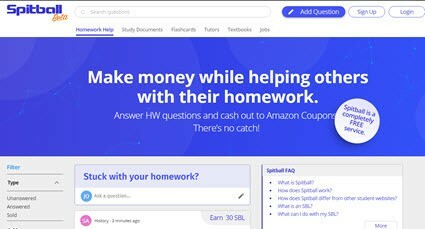 Spitball claims you can make money while helping students with their homework. Apparently, all you need to do is select the question and answer it without any commitment. So, can you really trust Spitball or is it a scam? Read my review below to find out! By the way, if you want to learn the proven method that earns me over $1,000/mo from my laptop, check out my #1 recommendation (hard work required). Price: It’s free to join and answer questions. The cost to ask questions vary, but you can expect to pay $0.50 – $1 per question. 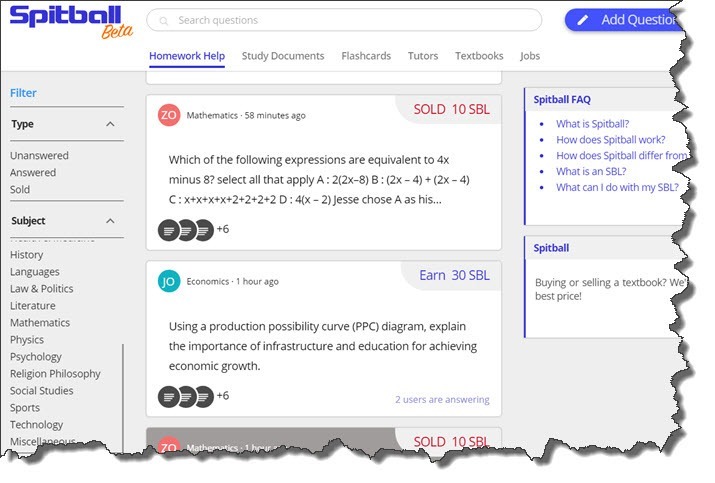 Spitball is a unique marketplace where students can ask and answer questions, share knowledge, buy and sell textbooks and more. By answering questions, you will earn tokens (SBL) that can be exchanged for Amazon gift cards. The company claim Spitball is a decentralized platform, and thus, costs are significantly reduced compared to other student sites. So, it’s becoming increasingly popular, but there are some downsides that I would like to explain later. Depending on your knowledge, and how fast you are, this can be an easy job. You can only redeem via Amazon gift cards. PayPal is not accepted. Competition is high, so you will answer many questions for free! The answers are not trustworthy because they come from anyone on the internet. Therefore, I recommend you don’t copy the answer to your homework without proper research unless you don’t care about your score. All you need is to register your email address and mobile phone. To activate your account, click the confirmation link in your email and provide the code that will be sent to you by SMS. You will earn 100 SBLs just for signing up, which is $2.50. As soon as you log into Spitball, you will see the board of questions along with their token value. On the left sidebar, you can access all the questions by subjects. There are currently 24 subjects to choose from accounting to technology. The top questions are the most recently added, and because there are many people online trying to earn SBLs, you must be FAST! In a matter of seconds, someone will probably answer the question, and after a few minutes later, there will be many competing answers. The person who asked the question can choose the best answer to be rewarded. Most questions are worth between 20 and 40 SBL, but you can also find those that worth 100 SBL our more. I decided to spend my signup bonus on two questions only to test the system. 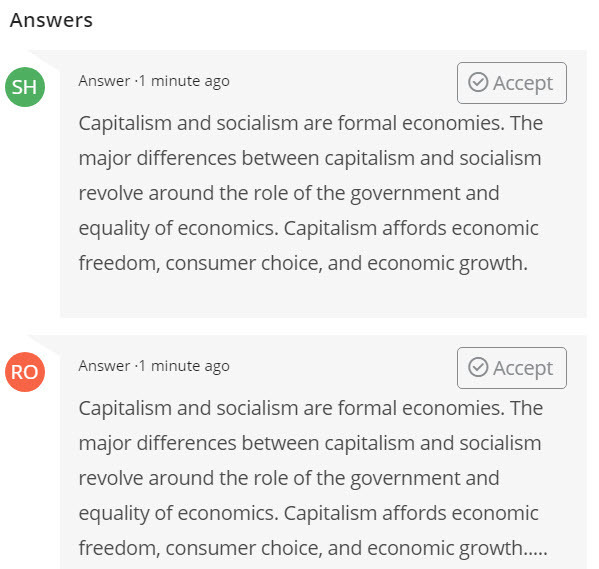 Most answers that I received were basically a “copy and paste” from other websites. Plagiarism! Some users don´t even take the time to search the internet. They simply copy from another answer just above, which is the well-known lazy method. In the second question, I took the time to elaborate a question that would require more research. I asked who was elected the next president of Brazil and what are 5 of his government plans. Many incomplete answers followed which did not mention any of his 5 plans. Some responses had lots of information I didn´t even ask! So, my suggestion here is that you should wait a bit to get more quality answers. Spitball is also a platform that connects students with other sites where they can buy and sell textbooks, study documents, hire tutors and even find jobs. As I already mentioned, you can only redeem your SBLs via Amazon gift cards. The minimum you can redeem is 1000 SBL, which is $10. It’s important to note that the more SBL you have, the more valuable they are. For example, it’s much better to save 4000 SBL to get $100 than spend 1000 for just $10. Final Thoughts – Is Spitball a Scam? No, it isn’t a scam. However, you can waste a lot of time answering questions for free. In my opinion, the platform is also problematic for students because most answers are not trustworthy. Many of them are plagiarized from God knows where. I think Spitballis much better if you need help with exact sciences such as mathematics, chemistry, and physics. For other subjects, Google is still your best friend. I hope this Spitball review was helpful to you. If you have any questions, please let me know in the comment section below.